Do you want to learn more about Afrofuturism? 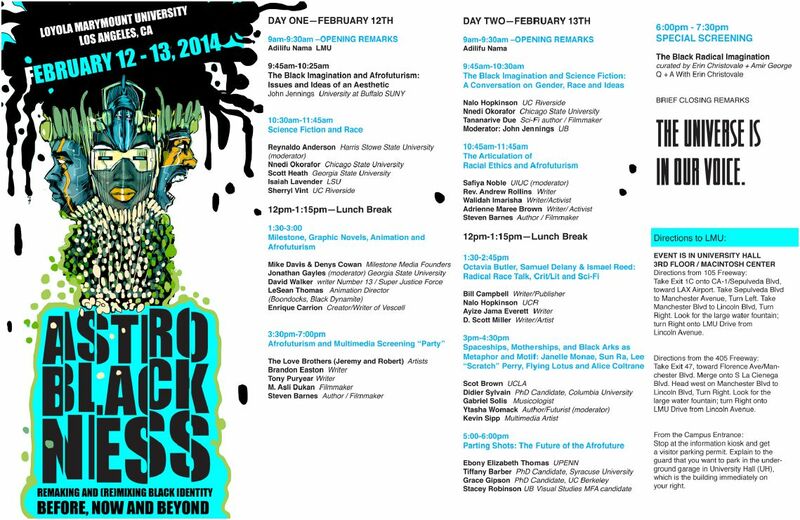 On Feb. 12 and 13 Loyola Marymount University (LMU) in Los Angeles hosts the AstroBlackness Conference. The two-day event will discuss black identity through the lens of Afrofuturism. Award-winning SF writers Nalo Hopskinson, Tananarive Due and Nnedi Okorafor are panelists for the The Black Imagination and Afrofuturism: Issues and Ideas of an Aesthetic workshop. John Jennings, professor/artist at SUNY Buffalo moderates. Ytasha L. Womack, author of Afrofuturism: The World of Black Sci-Fi and Fantasy Culture will moderate the Spaceships, Motherships, and Black Arts as Metaphor and Motif: Janelle Monae, Sun Ra, Lee “Scratch” Perry, Flying Lotus and Alice Coltrane workshop. Other special guests include Milestone Comics founders, Mike Davis and Denys Cowan; LaShawn Thomas- animation director of the Boondocks and Black Dynamite, Reynaldo Anderson, editor of Afrofuturism 2.0 and D. Scott Miller, creator of the Afrosurrealism Manifesto. The event will be held at LMU’s University Hall on the 3rd Floor/Macintosh Center. The event was coordinated by Professor Adilifu Nama and Jennings. Hope to see you there! Do you think that there will be a conference proceedings book, similar to the Wiscon proceedings published yearly by Aqueduct press? I believe a summary is in the works. This entry was posted on January 19, 2014 by iafrofuturism and tagged 2014, Afrofuturism, AstroBlackness, John Jennings, Nnedi Okorafor, Ytasha L. Womack.